As we welcome the month of Dhu al-Hijjah in which the Hajj Pilgrimage takes place, we should strive to do righteous deeds, especially during the first ten days of this sacred month. Imam Zaid Shakir, the prominent American Muslim Imam, reminds us of the virtue of the first ten days of Dhu al-Hijjah and the devotional practices that are recommended during these blessed days in the light of the hadiths. "There are no days in which righteous deeds done during them are more beloved to God than these days," our Prophet (pbuh) said, referring to the first ten days of Dhu al-Hijjah. These blessed days are the greatest days of the year and for the Ulama (religious scholars), they are even more distinctive than the days of Ramadan. 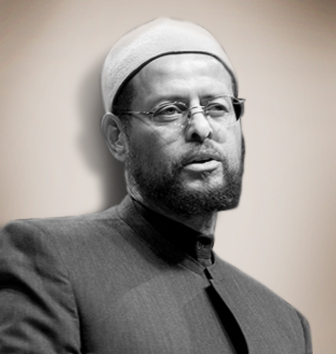 Imam Zaid Shakir, born in Berkeley, California, he accepted Islam in 1977 while serving in the United States Air Force. He obtained a BA with honors in International Relations at American University in Washington D.C. and later earned his MA in Political Science at Rutgers University. While at Rutgers, he led a successful campaign for disinvestment from South Africa, and co-founded a local Islamic center, Masjid al-Huda. After spending a year in Cairo, he became a lecturer in Political Science at Southern Connecticut State University in New Haven, Connecticut, a position he held until 1994. As Imam of Masjid al-Islam from 1988 to 1994 he spear-headed a community renewal and grassroots anti-drug effort, and also taught political science and Arabic at Southern Connecticut State University. He then left for Syria to pursue his studies in the traditional Islamic sciences. For seven years in Syria, and briefly in Morocco, he immersed himself in an intense study of Arabic, Islamic law, Quranic studies, and spirituality with some of the top Muslim scholars of our age. In 2001, he graduated from Syria's prestigious Abu Noor University and returned to Connecticut, serving again as the Imam of Masjid al-Islam, and writing and speaking frequently on a host of issues. That same year, his translation from Arabic into English of The Heirs of the Prophets was published by Starlatch Press. Zaid Shakir is amongst the most respected and influential Islamic scholars in the West. As an American Muslim who came of age during the civil rights struggles, he has brought both sensitivity about race and poverty issues and scholarly discipline to his faith-based work. Fasting the first nine days of Dhu al-Hijjah , especially Day of ‘Arafah has a great virtue. We should strive to fast as many of the first nine days as possible together with the day of ‘Arafah which by itself has a great reward. Prophet Muhammad (pbuh) said, "I anticipate that fasting the Day of ‘Arafah will atone for the sins of the previous and coming year." We should carefully monitor and control what we say and what we listen to as well as our gazes during these blessed days and especially on the Day of ‘Arafah. Our Prophet (pbuh) said "[Concerning] the Day of ‘Arafah, whoever controls his hearing, gaze, and speech on that day, he will be forgiven." We should engage in dhikr more during these days and remember Allah through words of praise and glorification more frequently. Special emphasis is put on the following phrase as Prophet Muhammad (pbuh) was said to repeat this more than any other on the Day of ‘Arafah: "La ilahailallah, Wahdahu La Sharika lah, Lahul Mulk, wa lahul Hamd, biyadihi Khayr, wa Huwa ‘ala kulli Shayin Qadir: There is no God but Allah. He is alone without partners. His is the dominion, and unto Him is all praise. With Him is all good, and He over all things has power." During these blessed days, especially on the Day of ‘Arafah, we should constantly seek forgiveness from God and we should pray for liberation from the Hellfire. Imam Ali related, "God liberates people from the Hellfire everyday. And there is no day when more people are liberated from the Hellfire than the Day of ‘Arafah." During the great ten days of this blessed month, let us all try to abstain from disobedience and all types of sins and strive to increase our righteous deeds, our remembrance and supplication as far as possible to refresh our faith. Zaid Shakir is a prominent Islamic scholar in the United States. He teaches Arabic, Law, History and Islamic Spirituality. Born in 1956, Shakir in California he became a Muslim in 1977. He has studied International Relations at the American University, earned his MA in Political Science from Rutgers University. He studied Arabic and Islamic sciences for seven years in Syria and is the first graduate of the prestigious Abu Nour University. He gives lectures around the world and has been called one of the most influential Muslims in the world. Please type '136' into this field.